A Calvert report on the impact of ocean degradation on portfolios has drawn interesting conclusions about the role of investment in the health of our oceans. A new report has drawn insights from BlackRock and five other giants to identify five catalysts that could speed up stewardship among asset managers. Australia's active ETF industry could benefit as the US securities regulator softens its stance on daily disclosures for the segment. Read the latest news and white papers. 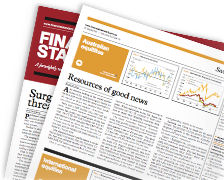 Get the FS Managed Accounts Monthly Newsletter. Managed accounts: Who really benefits? Do you intend to use managed accounts in 2019?